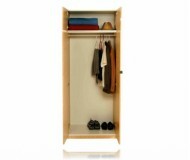 This Basics 557 contemporary wardrobe by Sharut Furniture is divided into a top and bottom section. The top section is divided into 2 sides. On the right side are adjustable shelves for storing your shoes, folded items or other bedroom accessories. The Bottom can be used as an additional self to store foot wears and other accessories in an orderly arranged manner. 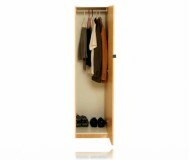 On the left side is a shelf with hand rod to store both hanging and non-hanging clothes. On the bottom section there are 3 Interior drawers for storing non-hanging items. Create virtually unlimited customize interior configurations by placing addition units side by side for seamless integration. It's easy to match this wardrobe armoire with any dacor with your choice of case finishes and available in both lacquer and mirror fronts.